The latest type Sloane is a military tractor biplane. This machine is equipped with a 130 h.p. 6-cylinder water-cooled engine. Climbing speed id 500 feet (152 meters) per minute. The maximum and minimum speeds are 82 m.p.h. (130 kilometers) and 47 m.p.h. (75 kilometers). The load carried is 900 lbs (410 kilograms). Speed 85 to 47 m.p.h. THE SLOANE "H-1" TRACTOR BIPLANE. THIS aeroplane has been designed and built in America to meet the requirements arising from the present war, for a reliable and speedy tractor capable of carrying a moderate load for a flight of from 4 to 6 hours. In every respect this machine is a great advance over anything previously built by the Sloane Manufacturing Co., of North Avenue, Plainfield, N.J. Great care has been exercised to obtain the most advantageous combination of speed, safety, climbing and weight-carrying possible in a machine of this class, and the designers have somewhat exceeded the usual requirements for strength, so that a factor of safety in excess of seven has been obtained. Actual tests have shown the flying qualities of this machine to be entirely satisfactory. It is stable and easy to control even in very heavy weather. The machine is equipped with a six cylinder 125 h.p. Hall-Scott motor, 5 ins. bore and 7 ins. stroke, which has shown itself to be the best motor available for the work required. The wing curve employed is very satisfactory, and has been developed by actual experience and wind tunnel experiments. The wings of this machine are backswept 10°, and the upper plane is staggered forward 10°, whilst both upper and lower planes are set at a slight dihedral angle. The main planes are of standard construction, the ribs being built up of basswood, and then slipped over the main beams. The latter are of Alaskan spruce, measuring 2 ins. by 3 ins. and 2 ins. by 2 1/2 ins. front and rear respectively. The trailing edge is steel. The whole is internally braced with cable and wire, and three steel drift braces are located between the beams at strut points. Beams are reinforced so that no wing clip bolts pass through them. Upper and lower planes are separated by four pairs of streamlined spruce struts, two pairs on either side of the body, and by two pairs of short struts from the body in the centre. The upper planes are attached to a small inner pannel, the same width as the body, and the lower planes are attached direct to the latter. Ailerons are hinged to the extremities of the rear spars of both top and bottom planes. The tail planes consist of a horizontal stabilizing plane, to the trailing edge of which are hinged the elevators. Between the latter is the rudder, in front of which is a vertical triangular fin. 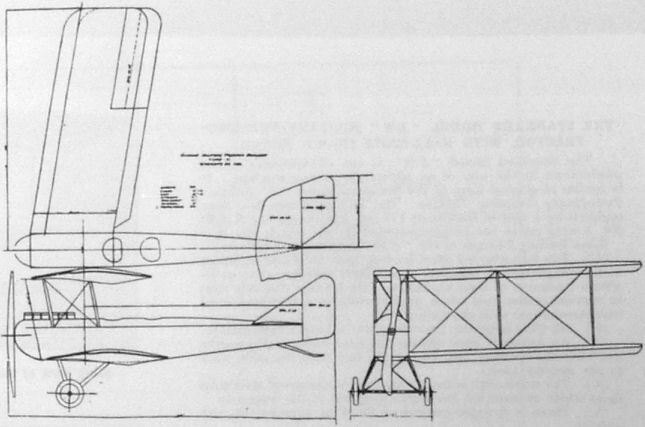 The fuselage is rectangular in section, of streamline form, tapering to a vertical knife edge at the rudder post. The longitudinals are ash and spruce, tapering from 11 in. square to 1 in. square, and the uprights of the same material. Back of the pilot's seat solid wire is used for cross bracing and forward of its cable. Specially designed clamps are used to hold the struts without piercing the longerons. The pilot's and passenger's seats are arranged in tandem, the pilot occupying the rearmost. The whole nose of the fuselage is enclosed by aluminium, and the cockpits are provided with aluminium covers to protect the passengers. The rest of the fuselage is covered with linen doped and varnished. The engine is mounted on two ash beams, 2 ins. by 5 ins., which are hung on two hot drawn steel plates, which reinforce the fuselage as well. The radiators are of the vertical tube type specially designed for the machine, and are mounted one on each side of the fuselage. The landing chassis is of the two-wheel type. The tubular streamline axle is mounted on two extra heavy laminated U's. Two steel tension and compression members maintain the spacing of these two U's. Four cables stiffen the landing gear so that side strains will not affect it. The usual rubber cord shock absorbers are used in the axle. The axle may be removed without disturbing the rubbers. The tyres are 26 ins. by 4 ins. double tube. The principal dimensions of the model H-1 Sloane tractor are as follows: Span, 38 ft.; chord, 6 ft. 6 ins. ; gap, 6 ft. 3 ins. ; overall length, 34 ft.; supporting surface, 510 sq. ft.; speed, fast, 85 m.p.h. ; speed, slow, 47 m.p.h. ; climb (3,000 ft.), 7 1/4 minutes; load, 1900 lbs. ; weight packed for shipment, 4,300 lbs. The latest Sloane Military Tractor Biplane. - This machine differs, apart from details, from that described in our issue for May 21st, in the three-wheel landing carriage, the vertical tail fin, and the fitting of a 90 h.p. water-cooled Kirkham engine. 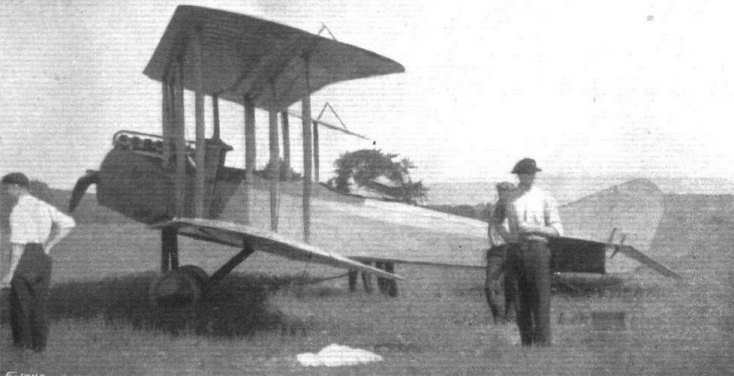 The Sloane biplane, with back-swept wings, and 100 h.p. Hall-Scott motor. A side view of the Sloane tractor biplane. The Sloane tractor biplane from the front. The Sloane tractor biplane as seen from behind.